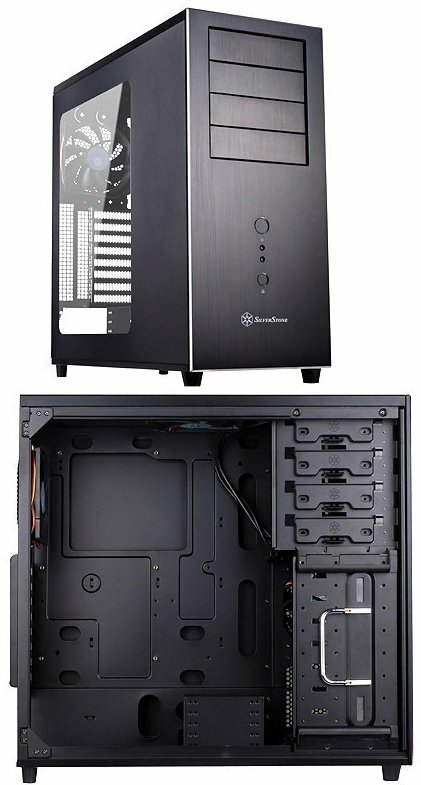 SilverStone revealed the TJ04-E at CES 2012, the successor to the TJ04 case which was launched in 2004. This new mid-tower is currently available for pre-order at 129EUR, with availability slated for later this month. Known as the TJ04-E (E is for Evolution), the new chassis has an exterior that resembles the TJ04, but comes with a 'vastly' improved interior that can hold up to four 5.25-inch drives, nine 3.5-ich hard drives, six SSDs, and graphics cards up to 17 inches long. The TJ04-E measures 214 (W) x 489 (H) x 489 (D) mm, it weights 9.6 kg, and features a steel structure, an aluminum front panel, ATX and micro ATX motherboard support, tool-free mounting for 5.25-inch drives, a custom HDD cage with built-in heatsinks and SATA cables, an I/O panel with two USB 3.0 ports, three pre-installed 120 mm fans (one on top, one on the right panel, one at the rear), and, optionally, a side window.